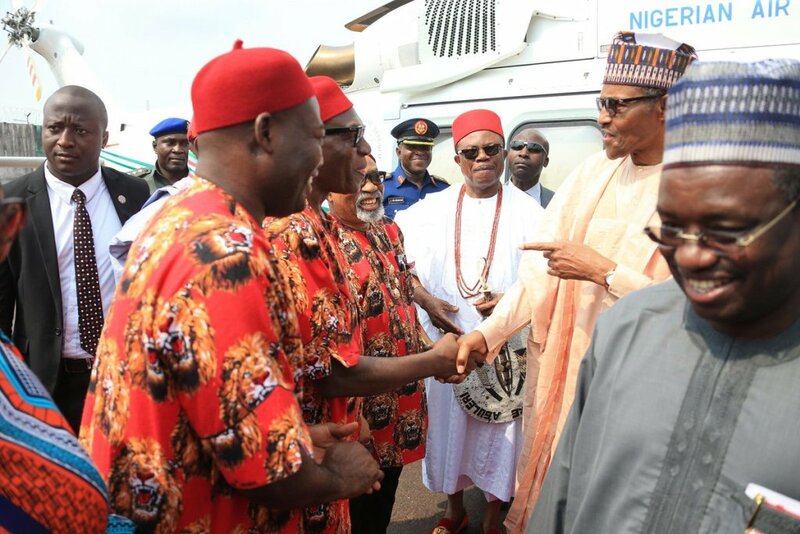 Anambra State Coordinator of Buhari and Osinbajo Campaign, Senator Andy Uba who has made all proper arrangement for President Muhammadu Buhari's visit to Onitsha, Anambra state was caught on camera welcoming President Buhari to Anambra. President Buhari was accompanied by Minister of Labour and Employment Senator Chris Ngige, the APC National Chairman, Adams Oshiomohole, the Minister of Transport, Chibuike Amaechi, Governor of Lagos, Akinwumi Ambode and the party National Auditor, Chief George Moghalu. Sen. Uba, Margery Chuba Okadigbo, Emma Anosike, Hope Uzodinma, Hon. Tony Nwoye, Bar. Basil Okonkwo among others stormed the commercial city of Onitsha in commission of the Ziks Mausoleum. President Buhari while commissioning of Zik mausoleum said that late Dr Nnamdi Azikiwe as was not only a Nigerian but a nationalist who chose to be credible and indelible in service and leadership. The President described Dr Azikiwe as an epitome of peace unity and one Nigeria and we owe him as a duty to sustain and promote his national patriotism and accomplishment. “I inherited some of the Federal Government projects that were abandoned by the successive administrations which include the Ziks Mauseloum, the Enugu Onitsha Express road, Enugu Okigwe Port Harcourt road and the 2nd Niger Bridge and I have chosen to ensure the completion of these projects part of which we are commissioning today, he said”. He said that his administration has successfully completed projects in the South East particularly in Anambra state abandoned twenty years ago, adding that the 2nd Niger Bridge valued at N302 billion is ongoing. He said that too many unemployed youths were now enjoying.